Once, in a client pitch with a large healthcare company we were asked to give reassurance that our account manager would not be working in a basement somewhere in their underwear. Stunned silence ensued, but it has since become a laughable moment. With social media being such a new field, it’s common for our clients to ask about how we work, or where we work, or even, how we do our work. To answer those questions we’ve compiled a sample week in the life at SoMe. 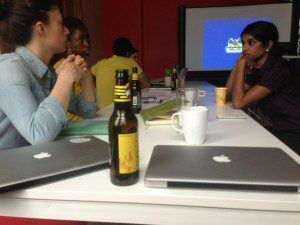 Every Monday, we begin with our weekly team meeting to strategize, share updates, and most of all, work on the top 2-3 of challenges that we’re all facing for the upcoming week or marketing challenges that we’re facing. 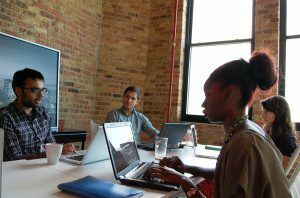 Monday is our day to set our goals, plan for the week, and work on content production – all done in-house at our Chicago office at Enerspace Co-Working. Tuesday & Wednesdays are focus days for our social media team to work with clients and attend client related events to research, produce, and document content for the week. We often are on-site and visiting to meet with our clients so we have authentic & fresh content to engage & interact with the online community that we’re building and managing. 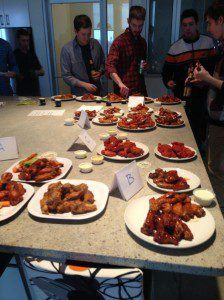 Researching wings for a client pitch for a national pizza brand. 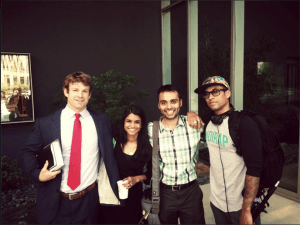 SoMe co-founder, Madhavi, moderating a panel for our Real Estate-Social Media Conference, Leap, in November. On most Thursday’s we’re still out and about and our clients are gearing up for the weekend. We’re also meeting internally to share knowledge, best practices, and other tools & techniques so we can implement those suggestions for all of our clients. 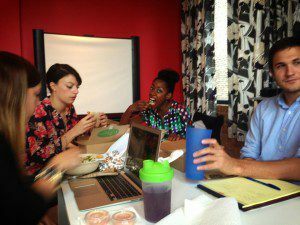 Our weekly “Lunch and Learn” to share our insights with the entire team. Fridays? Near the end of the week, we’re ready to review the week’s results, work together on our projects in the office, and have some fun at client events and other activities. 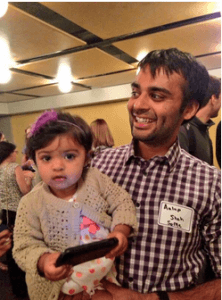 SoMe co-founder Aalap with the youngest social media adapter, his daughter Arya at Women In Tech, an event hosted by SoMe, BIN 36, and Good Vines. 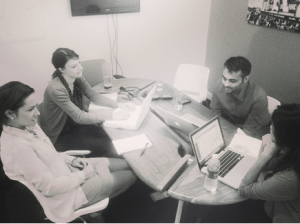 Client strategy meeting to kick off launch for Inc Magazines Trep Life Series. 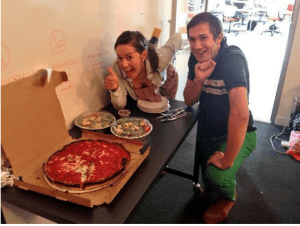 Fridays mean pizza in the SoMe office. 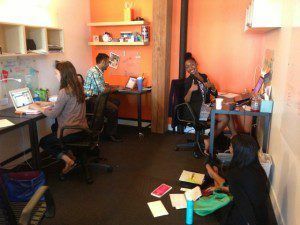 Running a social media agency means rolling with the punches, thinking on your feet, and embracing the unpredictable nature of an industry that’s still so new to so many. But this is why we love what we do. On a special note, Madhavi and I are proud to celebrate 2 years of the initial paper sketch of what SoMe is – through pivots, startup challenges, winning both big and small clients, we’re proud of our team and what we’ve accomplished and are incredibly excited about what the future holds for us. Continue following SoMe’s journey on Twitter, Facebook and on our blog! And send us any questions you still have about what we do and how we do it. We’re happy to answer!